I have these pieces hanging in my home to remind me of my roots. 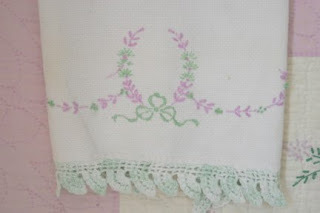 They were made by my grandmothers, who never knew each other or saw each others' work. I love that they go together so beautifully. 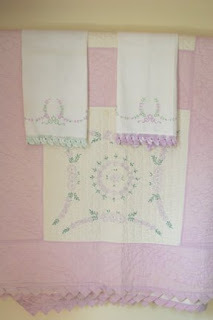 The towels were made by my mother's mother. I never knew her, though I would have loved to. The quilt (and many others) was made by my father's mother. I was fortunate to know and love her. She taught me to quilt when I was 18, and I will never forget that! It was great fun to have her show me how to do something that was so second nature to her. 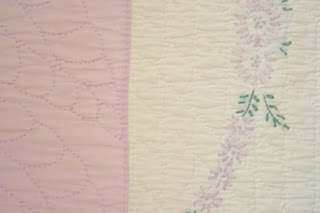 I remember her saying, "You'll know you're a good quilter when you can quilt 12 stitches to the inch." I've never made it yet! She was awesome. So whatever I have in my hands, I come by it honestly. It's in the blood, and I'm grateful for it.